KARACHI: “Everything I did is a part of history now. To live with history is difficult but there will be people, who will say one day, there was a man who did it and did it so differently.” Those were the last words of the legendary Moin Akhtar, as recorded in an interview with The Express Tribune , before he left the world’s stage – to a standing ovation awaiting his final bow. The iconic comedian died of coronary failure in Karachi on Friday. He was 61. Master parodist and king of Urdu comedy, the man of a million characters but one identity and that of a true showman, Moin Akhtar was someone who could bring a smile to your face no matter how bad your circumstances. Born on December 24, 1950, Akhtar managed to achieve in the six dynamic decades of his life all one could imagine in such a small time span. He started off as a stand-up comedian in 1966-67 by impersonating Hollywood actor Anthony Quinn and John F Kennedy’s speech in which he also mimicked the voice of the former president. Akhtar was more than just a class act and that is why at a young age of 13, he played the character of Shylock in Shakespeare’sThe Merchant of Venice. Be it theatre, TV, film, stand-up comedy, hosting and even singing Moin was the master of all crafts. It was his love for art and dedication to acting that made him famous not just within Pakistan but also across the border and the Middle East. His plays like “Bakra Qiston pae “ and “Buddha Ghar Pae Hae” which he performed alongside Umer Sharif are still watched across the world on DVDs and YouTube. He had already won wide acclaim following his regular appearances on Pakistan Television. He rendered several memorable performances alongside Anwar Maqsood and Bushra Ansari and is acknowledged as a pioneer, giving comedy in Pakistan a new look and direction. Sach Much, Makan No 47, Half Plate, Rozy, Eid Train and Bandar Road sae Keamari are just some of the highlights of his career with PTV. His character of Rozy which was a series based on an adaptation of the Hollywood classic Tootsie brought his great acting talents on the mainstream, as some considered his performance equal or even better than Dustin Hoffman’s. In his long-running show Loose Talk, Akhtar played more than 400 different characters in as many episodes and engaged in banter with Anwar Maqsood, who somehow managed to get the best out of him. Akhtar was a proud recipient of the Sitara-e-Imtiaz and Pride of Performance but apart from that he hosted shows involving major dignitaries and has performed on stage alongside the likes of Indian legends Dilip Kumar, Lata Mangeshker and Madhuri Dixit to name a few. However, the loss is felt by everyone and no one is more aggrieved other than his fellows, seniors and juniors. 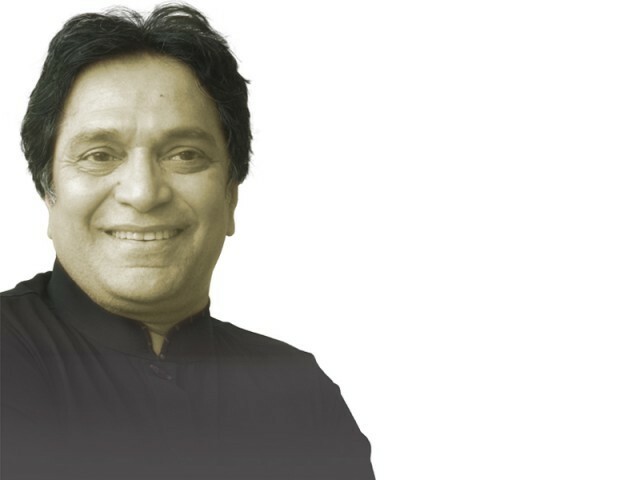 “With Moin Akhtar ends an era of outclass mimicry , he was the best impersonator of Pakistan and he is more than just a great loss to performing arts in Pakistan. He was a great person with the ability of creating wonders” Veteran TV and theatre artist Talat Hussain said. Celebrated comedian Umar Sharif considered Moin Akhtar his elder brother and his teacher. “I was planning to gather all the comedians in Pakistan to give a tribute to him, God had planned otherwise,” Sharif told The Express Tribune Senior artists like Rahat Kazmi are equally shocked by the loss. “ If a person can play over 250 characters in 250 different episodes of a TV show than the person is capable of doing anything, it is pointless to say that he left big shoes to fill, he is irreplaceable,” Kazmi told The Express Tribune. “He was the epitome of comedy in Pakistan and in a class of his own. We are lucky as Pakistanis to be able to call him our own,” Samina Ahmed, a senior TV actress told The Express Tribune. Behroze Sabzwari felt that the gap would never be filled. “We cannot imagine a TV or a stage without him but sadly now we have to accept this loss” Sabzwari said. “He polished Pakistani comedy and brought finesse to it,” said actress Sania Saeed. The younger lot of media professionals believe that they have lost an icon and a guiding light. “I cannot imagine a Pakistan without him, his images and words are etched in our memories and shall remain forever” Azfar Ali, a TV director told The Express Tribune. People like Javed Akhtar and Daler Mehndi from India also expressed their sorrow over the loss. Before his sad departure, Akhtar was planning to write a book about his experiences with foreign diplomats and Indian stars whom he had met and had had the privilege of performing with over the course of his career. Published in The Express Tribune, April 23rd, 2011. Pakistan Navy (PN) is gearing-up for AMAN-11, in which Navies of forty-nine countries have been invited to participate in SOF, B. Tactical, and War at Sea exercises over the North ******* Sea in March 2011. The first of the series of AMAN Exercises was held in March 2007, which proved to be a major success. During this exercise 14 Ships from the Navies of Bangladesh, China, France, Italy, Malaysia, UK and USA participated. In addition to that, SOF/EOD teams from Bangladesh and Turkey also participated in Special Operation Forces (SOF) Exercises and 21 countries attended the exercise as observers. AMAN-09 was held in March 2009. During this Exercise 23 ships, 13 Aircraft and 9 SOF teams of Australia, Bangladesh, China, France, Japan, Malaysia, UK, Nigeria, Turkey and USA participated. Observers from 27 countries also attended the exercise. The resounding success of the first two AMAN exercises, prompted PN to expand the number of participants in AMAN-11. Thirty-nine navies are participating in the current exercise including those with assets as well as observer countries. Navies with assets include: Australia, China, France, Indonesia, Japan, Malaysia, Saudi Arabia, Turkey, Sri-Lanka, United Kingdom and USA. The AMAN exercises hold a lot of importance as they define and help improve the level of operational readiness, war- preparedness, task-accomplishment, Refine Command, control and communication procedures and tactics. Additionally, the war-games will enhance inter-operability and tactical proficiency, develop common tactics against asymmetric air, surface, and mine threats, promote ASuW / Air operations and its related interoperability between the participating unit, lethality of force, Survivability for the armed service. The international perspective of AMAN helps the PN meet international standards and integrate into the global system of maritime security at the same time the Pakistan’s naval forces also get a chance to showcase its military prowess. Maritime route is predominantly the most utilized means for global trade. The world is faced with ever increasing security threats due to terrorism and piracy which has sharply risen in the past decade. Hence, international trade can be adversely affected if the capabilities, tactical communication and coordination within the coalition forces are not bolstered. Integrated international exercises like AMAN are aimed at improving the working relationships amongst the coalition partners’ forces. Thus the operational readiness can be boosted to the levels required to tackle the security threats posed, thus enabling the coalition forces to effectively maintain maritime stability for international trade. When it comes to joint operations with other countries, PN has always extended a helping hand to maintain peace, emphasizing its slogan for AMAN-11: “Together for Peace.” With the participation of 39 Navies, PN is endeavouring to establish an understanding between the cross cutting cleavages, encompassing maritime security operations, anti-terrorist operations and humanitarian assistance operations. Enhanced cooperation will definitely go miles in improving Response Tactics, Techniques and Procedures (RTTP) to build a sound preparedness level against conventional and non-conventional threats. One of the key features of AMAN-11 is the showcasing of PN’s latest addition to its fleet: the F-22p Frigates. Everything ranging from the men in white to weapon systems will be gauged and bench-marked. A range of Surface Tactical Exercises are going to be held, included but not limited to; “Basic Communication Exercises” , “Go Fast Attack”, the tricky “Night Encounter Exercises”, etc. Air Tactical Exercises encompassing “Cross Deck Landings”, “ASV Strikes”, leading to exercises of the likes of “LRMP Interdiction/LRMP fighter evasion exercises”, “Search and Rescue” will be conducted. The Special Operations Forces Exercises will include: HVBSS Operations, SVBSS Operations, Static line and Freefall water Jumps, Special Purpose Insertion and Extraction (SPIE) Operations, EOD Exercises, Maritime Counter Terrorist Exercises, Close Quarter Combat (CQC) Exercises, Frogman Exercises, and VBSS Operations during MIO. War at Sea Exercise (WASEX) will commence just before the closure of the sea phase. For this Exercise the participating Units will be divided into two task forces Blue and Orange. WASEX is going to incorporate Air-surface Warfare exercises as well as Anti-Air Warfare exercises. Pakistan Navy has established its reputation in the arena of global maritime security by orchestrating AMAN-07, AMAN-09 and now AMAN-11. Pakistan holds a significant responsibility of maritime security, as 90% of the energy trade is carried out through the ******* Sea. Approximately 15 million barrels of oil are shipped through the ******* Sea. PN, a component of the coalition forces, has the responsibility of providing freedom of navigation and uninterrupted flow of trade to avoid any adverse effects on the global economy. PN has been a member of Coalition Maritime Campaign Plan since 2004 and has successfully commanded TF-150 four times, which is a tribute to its professionalism and honour for the country. Pakistan is now also a part of the new US led multinational Task Force-151 for counter-piracy operations. The upcoming AMAN-11 will also increase PN’s already well-established reputation of excellence by multiple magnitudes. This will also give the navy a chance to take on the helm of the recently established TF-151. AMAN-11 will be instrumental in enhancing the tactical and operational readiness amongst its participating navies. Apart from the strategic relevance, existing ties between the participants will be augmented. Limelight will also be shed on the strategic importance of the North ******* Sea and the Indian Ocean. In doing so, Pakistan Navy’s geographical significance will be further magnified. Owing to Pakistan’s strategic location it is essential for our country to build this country’s maritime sector and to strengthen its navy, and leave a mark on friends and foes with such endeavours. —The author is an instructor at the National Defence University. Banglore (Routers) Our correspondent from India reported that an Indian psychic Parrot who’s name was Mali predicted Pakistan three times in a row as Cricket World Champion 2011.But his owner baba to make himself safe from Indian doggy party Shiv Sena killed his Parrot for predicting Pakistan. It is also noted that Indian Media is hiding this Hot news which can show real image of Indian democracy to world. Pakistani Nation is happy but mostly people express that they didn’t belief on any Psychic. Mamu a psychic has also predicted in T20 World cup 2010 semis that Pakistan ‘ll win but Pakistan lost that match.So we only belief on self power and we will lift cup from Mumbai. And will beat any one except Shiv Sena with our bat. Pakistan won by 46 runs against Canada: Pakistan beat Canada bye runs. .This is a big victory for Pakistan That Pakistan won from Canada on 17 match in ICC WC 2011. Pakistan won from Canada. This victory of Pakistan goes to Afridi. Afridi got 5 wickets against Canada. 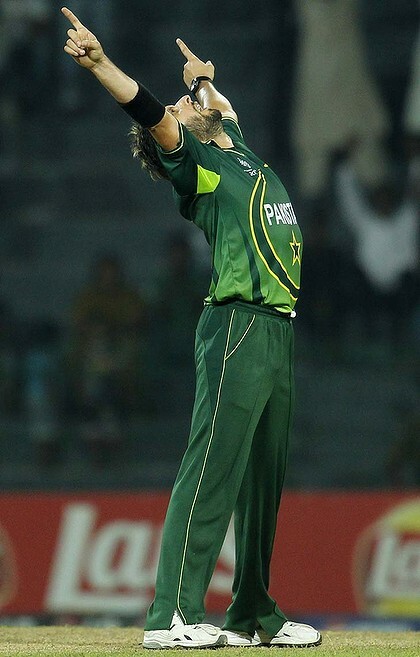 These wickets give a big help for wining of pakistan.what a spell from the captain, take a bow- Afridi! Stunning Shahid Afridi’s 5 wickets steer Pakistan to victory against Canada in Group A match here at R Premadasa Stadium on Thursday. Shahid Afridi made up for Pakistan’s ragged performance with the bat by collecting his second five-wicket haul of the World Cup as the 1992 champions beat Canada by 46 runs on Thursday. Canada looked as if they could produce the second shock of the tournament when they skittled Pakistan for 184 in just 43 overs and followed it up with some sensible batting from Zubin Surkari (27) and Jimmy Hansra to reach 104 for three. But once leg-spinner Afridi (5-23) bowled Hansra for 43, the Canadians lost their way and were all out for 138, handing Pakistan their third successive win in Group A.
COLOMBO: Pakistan skipper Boom Boom Afridi was excited on the victory against the tournament favourites Sri Lanka at RPC stadium Colombo on Saturday night and reclaimed that Pakistan is the most dangerous team in the World Cup. They say the World Cup is boring. They say that Pakistan have no chance of winning the title. They will be sitting down to breakfast and helping themselves to fat helpings of their own words. Both of those opinions will have to be hastily revised after Sri Lanka, second-favourites for the title by virtue of their home advantage, lost an enthralling match in Colombo. The 11-run margin of victory would have been larger still had Pakistan not shown some of those familiar failings that must make them so frustrating to support. But then, if they played perfect cricket, they would not be nearly so entertaining to watch. At the heart of the game was a duel between two of the most enthralling cricketers of modern times, Muttiah Muralitharan on the one hand and Shahid Afridi on the other. But if they were centre stage they had a splendid supporting cast. There were majestic innings from Misbah-ul-Haq and Younus Khan. And then there was Shoaib Akhtar, sweating with the effort of shrugging off the years so he could pound in as he once did in his pomp. He clean bowled Mahela Jayawardene with an unplayable off-cutter. And Kamran Akmal, veering between the brilliant and the utterly absurd, completed two waspish stumpings but bungled a pair of far easier chances. For the Sri Lankans Kumar Sangakkara gritted his teeth and did his damndest to play a captain's innings. And Nuwan Kulasekara followed up an inspired spell of death bowling with a slogger's knock of 24 from 14 balls that kept his side in the match right up until the final over. They needed 18 from it, but could only manage seven. Murali delivered a masterclass in off-spin after Sri Lanka lost the toss and were asked to bowl. His 10 immaculate overs cost 33 runs, a sum that only contained a single scoring shot that went for more than a single. Never mind any fours or sixes, Murali only gave up one solitary two. His two overs in the batting powerplay cost only five runs and included the wicket of Umar Akmal, diddled into slapping a catch to midwicket. By the end of his spell cricket fans everywhere were wishing that someone could talk him out of his decision to retire once the World Cup is over. And yet he finished on the losing side. As well as he bowled he could not dislodge either Misbah or Younus. They came together with the score on 105 for three, Pakistan having squandered a rollocking start by contriving a pair of the most idiotic dismissals imaginable. Mohammad Hafeez ran himself out after he held himself in position to admire his own sweep to short fine leg. By the time he looked around he found his partner, Kamran Akmal, was sharing his crease. Not long afterwards, Akmal decided to jump down the pitch and heave-ho at a delivery from Rangana Herath. He did not turn around to watch Sangakkara sweep off the bails, but kept walking back to the pavilion. After all that naivety, the contrast with Misbah and Younus could not have been starker. They hit only four fours between them in their stand of 108, and yet still scored at more than five runs an over, tick-tocking along by working singles into the gaps on the leg side. The Sri Lankans missed the death bowling of Lasith Malinga, out injured, and 32 runs came from the last three overs. That final flourish put Pakistan over the top, just. Though when the Sri Lankans were 76 without loss in the 15th over it did not look as though that would be the case. And then on came Afridi. If Muralitharan bowls with the cunning of Cardinal Richelieu, Afridi does so with the swagger of D'Artaganan. He took four wickets, meaning he now has nine for just 49 runs in two matches in the competition so far. He had Tillakaratne Dilshan cut onto his stumps, and then ripped a fast leg-break past Thilan Samaraweera's outside edge. When he had Sangakkara caught the game looked up, though of course his team's erratic fielding meant they found numerous ways to extend the game towards a thrilling climax. Cricket fans would not have it any other way. Pakistan won by 205 runs in the ICC World Cup Cricket 2011 match against Kenya. Man of the match in Pakistan Vs Kenya match was Umar Akmal of Pakistan team. Pakistan won the Toss and decided to bat and won the match with a good margin. Pakistan managed to score 317 runs in 50 overs by losing 7 wickets at a run rate of 6.34 runs. Kenya could only score 112 runs in 33.1 overs by losing 10 wickets at Run rate of 3.38 runs. Kenya who batted second was not able to win the match against Pakistan in this group match in ICC 2011 Worldcup. Umar Akmal who scored 71 runs was the top scorer for Pakistan. Collins Obuya who scored 47 runs was the highest scorer for Kenya. The Pakistan vs Kenya is the 6th match among World cup Cricket Group Stage matches. This match is scheduled to take place at Mahinda Rajapaksa International Cricket Stadium at Hambantota in Sri Lanka at 2.30 pm (IST) on Wednesday 23 February 2011.